Congenital gastroschisis, Autologous umbilical cord patch, Neonatal. Gastroschisis is a serious neonatal congenital abdominal wall defects [1,2]. To restore the exposed organs and a repair of abdominal wall as soon as possible, is the ideal method of treatment of children with gastroschisis. Since January 2012, our hospital used autologous umbilical cord patch to repair congenital gastroschisis in 11 new-born cases. The group of 11 cases: 9 cases of male, female 2 cases; age: 4~26 h; weight: 2.05~3.2 Kg. Abdominal wall defects are located in the right side of the umbilical, the gap is about 3~4 cm. In 7 cases the stomach, small intestine and colon were exposed to the abdominal cavity. In 4 cases the small intestine, colon, bladder prolapse outside the abdominal cavity. Four cases were hospitalized with scleredema and 1 case with congenital heart disease. After admission by fasting, gastrointestinal decompression, out of stomach contents (Figure 1). Figure 1: New-born with congenital gastroschisis before autologous umbilical cord patch repair. The operating room temperature is set at 28~30°C, children were placed in the circulating hot water blanket, tracheal intubation general anesthesia, in dwelling catheterization. Firstly, the intestine was exposed to warm saline and 0.1% warm iodophor carefully rinse, from the abdominal wall to the right side of the direction of transverse incision about 3 cm. The surgeon gently supported the expansion of the abdominal wall to expand the abdominal cavity, ligation of the umbilical artery and vein and umbilicus, and then the small intestine was emptied to determine whether there are other gastrointestinal malformations. The other exposed stomach, intestine, bladder and other prolapse were put back in. The autologous umbilical cord patch covered the umbilical right side of the cleft from left to right (Figure 2). Figure 2: New-born with congenital gastroschisis after autologous umbilical cord patch repair. Eleven cases of children were operated using autologous umbilical cord patch repair, postoperative children to send SICU for monitoring, continued gastrointestinal decompression, retention catheterization, the use of ventilator support treatment, and the application of parenteral nutrition and antibiotics. The ventilator was removed in 1 patient at 24h, in six patients at 48 h after surgery, and in the other 4 patients at 72 h postoperatively. All the 11 cases of children survived, no incision dehiscence and infection. In the first 7-8 d after operation, the gastric tubes were closed according to gastrointestinal decompression. The second day after removal of the stomach, micro-breastfeeding began if no vomiting. The deep-hydrolysed formula powder could be used if no breast milk. According to children’s reaction, we gradually increased feeding capacity. Due to echocardiography in children with embryonic prolapse of the abdominal cavity of the intestine by amniotic fluid soak and edema, children's intestine function is slowly recovering (need 3 to 4 w). So we use a small amount of meals, to prevent the return of aspiration and intestinal dysfunction. The average hospital stay in this group is 19.68 ± 2.75 d. All children were followed up for 6 months to 3 y. As a result, 8 cases of abdominal defect have been completely healed. The other 3 cases of children with small abdominal hernia received the secondary repair operation when 2 y old. They were also cured after the secondary surgery repair. (Figure 3). There’s no significant difference compared with the normal children. 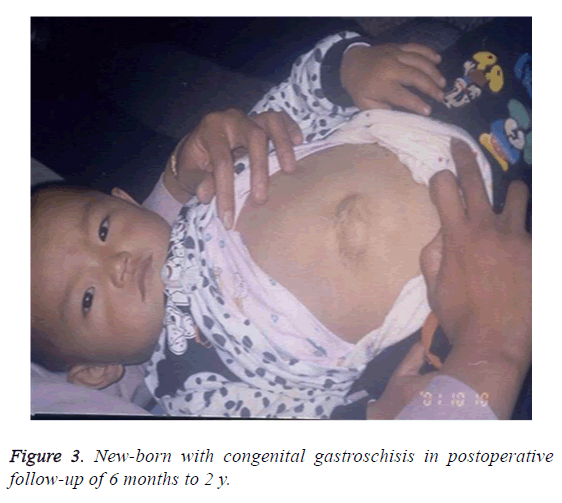 Figure 3: New-born with congenital gastroschisis in postoperative follow-up of 6 months to 2 y.
Neonatal gastroschisis is the most common abdominal wall defect disease. There are about 2 to 4.9 cases in 10,000 live births and males account for the majority [3,4]. From the embryonic abdominal wall formation process, the abdominal wall of the four pleats in the side of the lateral wall development pause or hypoplasia so lead to the deformities. Due to prolapse of the abdominal cavity of the intestine and soaking in amniotic fluid and edema in embryonic stage, bowel becomes thickened and hypertrophy, intestinal adhesion between the entire intestine obviously shortened. To congenital gastroschisis in children with premature children, we need pay attention to insulation, breathing support. The intestinal tract exposure not only increase the chance of pollution, but also lead to rapid loss of body fluids, water and electrolyte balance disorders. So the best way after the birth of children is to wrap in oil gauze out of the bowel, apply a large gauze pad and perform surgery as soon as possible. Because the bowel surface edema and exudation is not obvious, but after 20 min, the prominent bowel thickening and covering a layer of rough surface of the fibrinous membrane so that the bowel is gradually showing edema and hypertrophy. Restoration of the exposed organs and a repair of the abdominal wall is the best treatment for patients. Kidd et al. closed the abdominal cavity through direct surgery and Silo bag staging surgery and found that in Phase I closure group, patients had intestinal stenosis, necrotizing enterocolitis, and need to re-operation. In Phase I and staged closure group, the complications rates were 20% and 15%, respectively (P<0.001). However, the staged closure need good tissue compatibility patch. In the past we often use synthetic fiber membrane, polypropylene mesh, Gore-Tex tablets, flaps, dura mater or other biofilm to cover, or the form artificial abdominal hernia. After surgery the narrow hernia sac need to be squeezed every day. It not only increased the incidence of sepsis, but also prolonged parenteral nutrition time, even need the second operation . With the rapid development of medical science, more and more materials appeared in the medical field as a biomedical material to repair the defects of various parts of the human body [7-9]. Our hospital used allogeneic acellular biopsy patch repair on congenital gastroschisis in 9 cases. Because it is from natural skin tissue and treated with a special physical and chemical method, it can’t cause immune rejection of the cell composition, When implanted in the host body, allogeneic acellular biopsy patch will not cause serious immune rejection and can also induce the host cells into the three-dimensional framework, growth and reproduction, while generating new extracellular matrix components, gradually forming the host's own organization, and achieving satisfying clinical efficacy. However, biological tissue patch, after all, is allogeneic tissue, accompanied with the body contaminated, the fluid will accumulate between the patch and the skin after surgery, resulting in early postoperative patch and skin adhesion closure. The skin incision healing is not strong. We will put in the navel on the side of a needle suture is not too tight knot, early rounds with sterile gauze from the umbilical cord to the other side of the gently squeeze, in order to facilitate subcutaneous effusion Of the timely lead; and this patch is limited, often in short supply, the price of your side. And congenital gastroschisis in children with emergency, once diagnosed, should be immediately applied to surgery. Therefore, the material is convenient, affordable self-umbilical cord patch once applied to obtain a satisfactory treatment effect. Autologous umbilical cord patch can not only effectively increase the abdominal volume, reduce intraabdominal pressure, and has a certain tension, to meet the requirements of congenital erectile repair. Chin et al. thought that intra-abdominal pressure<20 cm H2O can effectively ensure the perfusion of abdominal organs, reduce the incidence of abdominal compartment syndrome. More important is the umbilical cord patch for the autologous tissue, and the wound around the abdominal wall after suture, has no immune rejection, or infection. So the patients can recover faster. So, how to ensure that children with congenital gastroschisis can be timely and effective use of their own umbilical cord patch it? We use the media, meetings, to the grassroots tour and other channels and the obstetrics and gynecology colleagues to maintain good and effective communication, called on everyone as long as the children with abdominal fractures, must be reserved 8-10cm umbilical cord, for surgery as a patch application; And the establishment of a congenital malformations prenatal counselling clinic, to pregnant women and their families detailed account of the baby's condition and prognosis, for the greatest degree of trust and cooperation. After years of efforts, it has achieved satisfactory clinical and social effects. In this study, we used autologous umbilical cord patch to repair 11 cases of congenital gastroschisis and all of them were healed successfully after first or secondary repair surgery. So we conclude that umbilical cord patch from the autologous tissue, has a good tissue compatibility, non-toxic, no foreign body rejection, and can effectively reduce the abdominal pressure. So it can repair gastroschisis, reducing the pain of children with surgery, while reducing the ideological pressure and economic burden of the parents. OConnell RV, Dotters-Katz SK, Kuller JA, Strauss RA. Gastroschisis: a review of management and outcomes. Obstet Gynecol Surv 2016; 71: 537-544. Safavi A, Skarsgard ED. Advances in the surgical treatment of gastroschisis. Surg Technol Int 2015; 26: 37-41. Aerg J, Kaban G, Tonita J. Gastroschisis: a sixteen year review. J Pediatr Surg 2003; 38: 771. Ross AR, Hall NJ. Outcome reporting in randomized controlled trials and systematic reviews of gastroschisis treatment: a systematic review. J Pediatr Surg 2016; 51: 1385-1389. Kidd JN, Jackson RJ, Smith SD. Evolution of staged versus primary closure of gastroschisis. Ann Surg 2003; 237: 759-765. Dariel A, Poocharoen W, de Silva N. Secondary plastic closure of gastroschisis is associated with a lower incidence of mechanical ventilation. Eur J Pediatr Surg 2015; 25: 34-40. Liang X, Zhang L, Lv Y. Treatment of total pelvic organ prolapse using a whole biological patch: A pilot study of 17 patients. J Obstet Gynaecol Res 2017; 43: 164-172. Ciampi P, Scotti C, Nonis A, Vitali M, Di Serio C, Peretti GM, Fraschini G. The benefit of synthetic versus biological patch augmentation in the repair of posterosuperior massive rotator cuff tears: a 3-year follow-up study. Am J Sports Med 2014; 42: 1169-1175. Dobradin A. Total preperitoneal biological patch indirect inguinal hernioplasty. Wiad Lek 2013; 66: 88-90. Chin T, Wei C. Prediction of outcome in omphalocele andgastroschisis by intraoperative measurement of intravesical pressure. J Formos Med Assoc 1994; 93: 691-693.